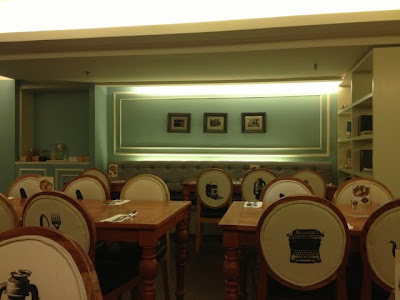 Food Escapade at Dekada | Vanity and Everything in Between. Last Sunday, Lawrence and I went to the mall for our usual Sundate. After all, it was our "7 years and 6 months" anniversary anyway. We went to Makati as I was supposed to buy these pumps from Jeffrey Campbell (only to find out that the last pair on my size is pretty much damaged). We didn't have proper lunch so we thought of just having dinner at the mall. We skipped Greenbelt since we always eat at the restaurants there. Lawrence thought of checking out Glorietta. Then on our way to Glorietta, we saw Dekada. It just recently opened in Glorietta and it's just beside the bridge connecting Landmark and Glorietta. Lawrence mentioned this to me before and we wanted to check it out so we both decided to just have dinner there. We checked the menu and we were sold. I think the bottle turned glass is cute. Shabby chic/country feel. So, this is how their set up looks like basically. The waiter said their food is good for 2-3 people and we didn't believe her. When our food arrived, we realized we ordered a lot. We actually weren't able to finish the food. Not because it didn't taste good. The food was superb! We just ordered a lot! 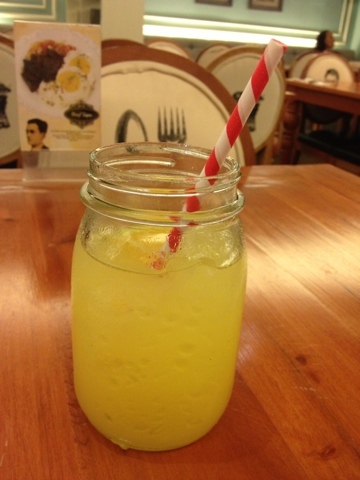 Lawrence and I forced ourselves to finish the Diniguan so we didn't have to bring it home. 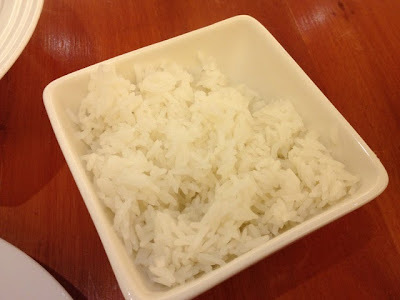 And, oh, we ordered 4 cups of steamed rice! The food was that good! I love their binagoongan - not too salty. Just right and they were pretty generous with the binagoongan. 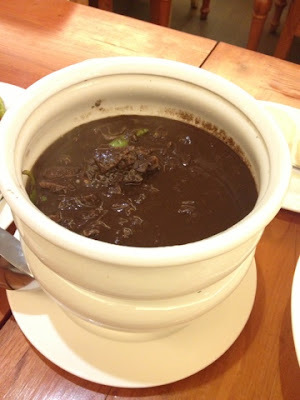 Same goes with their dinuguan. It was supposed to be dessert but we ate it as our viand for our rice. I didn't get to try the General's chicken but Lawrence liked it. I'm not 100% sure but I think Dekada is owned by Marvin Agustin. If that's the case, then he finally nailed having a restaurant that serves good food. I'm saying this because I'm not really impressed with his other restaurants - Mr. Kurosawa, John & Yoko, Marciano's and Sumo Sam. Filipino food might be a no brainer for it to taste good. 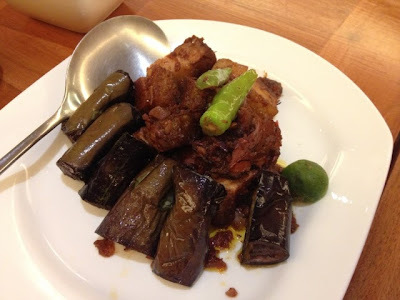 But there are still other Filipino restaurants that fail to deliver good taste. I'm just glad that Dekada nailed it. Lawrence and I think that Dekada is an affordable version of Romulo's and we see ourselves being regulars of this restaurant. Dekada is located on the 2nd Floor of Glorietta 3 (right before the bridgeway going to Landmark). 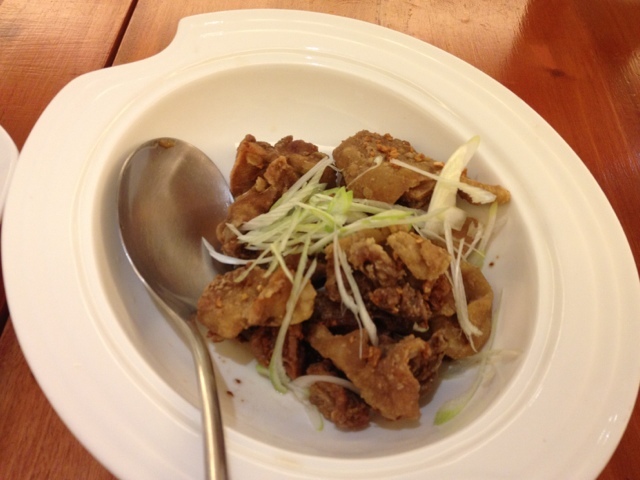 A big WOW for their Pork Binagoongan, .. I'm craving for it na. How I wish they have another branch near by. Thanks for your starving post, lol! What's In My Office Makeup Bag? Tory Burch is on SALE! Make the Wrong Shade of Foundation Work for You!